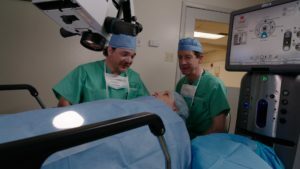 The good news is that cataract surgery is one of the safest, most successful and commonly performed surgeries in the United States. As with any surgical procedure, there are inherent risks and complications that can occur. But 9 out of 10 people regain very good vision somewhere between 20/20 and 20/40 according to Prevent Blindness America (PBA). The even better news is that with FDA approved advanced lens technology patients have options that reduce or eliminate any need for glasses after cataract surgery. A cataract is the clouding of the eye’s naturally clear lens. In addition to the natural aging factor, there are other factors that can cause cataracts. These include exposure to ultraviolet light, trauma, diabetes and even lifestyle factors such as diet, alcohol consumption and smoking could lead to the development of a cataract. As cataracts begin to develop, many things in life will begin to look less vivid. Colors will not be as bright. Objects become cloudy and blurry. Driving at night will be more and more difficult and you will be begin to have issues with glare. Fortunately, modern-day cataract removal and lens implantation is one of the safest, most common – AND MOST SUCCESSFUL – surgical procedures performed today. In the past, cataract patients were forced to wear reading glasses and/or bifocals after their procedure. Today, our new lens implants are designed to reduce – and in some cases – eliminate your dependence on corrective eyewear after cataract surgery. In your parents’ or grandparents’ day, cataract surgery was considered risky, required a lengthy hospital stay and was usually postponed for as long as possible. 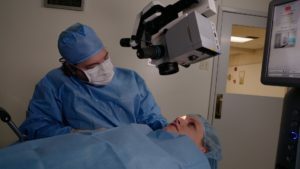 Today, cataract surgery is performed on an outpatient basis and takes only a few minutes. It is now one of the most common and successful medical procedures performed. In fact, following cataract surgery, many patients experience vision that is actually better than what they had before they developed cataracts. See what cataract patients have to say about their cataract surgery. You will arrive at The Wallace Laser and Surgery Center about an hour prior to your procedure. Once you have been checked in you may be offered a sedative to help you relax. You will then be prepared for surgery. The area around your eyes will be cleaned and a sterile drape may be applied around your eye. You will remain awake and comfortable during your procedure. Eye drops or a local anesthetic will be used to numb your eye. When your eye is completely numb, an eyelid holder will be placed between your eyelids to keep you from blinking during the procedure. 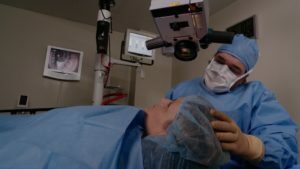 A very small incision will be made and a tiny ultrasonic probe will be used to break up the cataract into microscopic particles using high-energy sound waves. This is called phacoemulsification.